Spotykach Maintenance RC viewer updated to version 5.1.10.520444 on October 11th. Animesh RC viewer updated to version 6.0.0.520211 on October 8th. Environmental Enhancement Project (EEP) viewer updated to version 5.1.10.520475 on October 12th. Black Dragon viewer updated to version 3.3.2 on October 12th – release notes. Kokua 64-bit viewer updated to version 5.1.9.43833 (RLV) and 5.1.9.43834 (non-RLV), on October 11th (release notes). Art By Nature is the name Ani (Anibrm Jung) uses for her physical world photography presented through Second Life. I’ve covered her work in the past (see here and here), as I’ve always found it a stunning tour-de-force of photography sans the need for post-processing; and I’m happy to be able to say that she has returned once again to hosting her own gallery space in-world, this time located on the mainland region of Gimchi. Based in the Netherlands, Ani is an award-winning photographer who has been active in Second Life since 2006. She specialises in photographing nature – hence Art by Nature – and captures many of her images in her own garden using only her camera and natural light. Everything is framed directly through the viewfinder, and no cropping nor image manipulation is used after the fact. In this way, we are able to see each picture exactly as she did when taking it, allowing us to share her own sense of closeness with her subjects. The result of this are images that are completely captivating in their depth and presentation, which Ani rightly displays in-world in a large format (although I believe her work is resizeable post-purchase). Split across two floors, her new gallery presents pieces that combine her marvellous work with the macro lens with her broader landscape work, offering the visitor a rich mix of her art. Broadly speaking, the ground floor focuses on Ani’s landscape work and features some truly stunning photos of sunrises and sunsets, the majority making beautiful use of water and light to produce genuinely wonderful images. On the upper floor, the focus is towards Ani’s macro work – and this really has to be seen to be fully appreciated. It is in her close-up images of flowers and Ani captures the majesty of nature we can all too easily take for granted when captivated by the broader scenes of the world that nature presents to us. From the delicate touch of a bee collecting pollen through to the beauty of trees and contrails caught against a sunset to the playful delight of a cat, there is so much here to capture the eye, making a visit more than worthwhile. All of the images displayed are available to buy, and if you do visit the gallery, please consider a donation towards its upkeep. 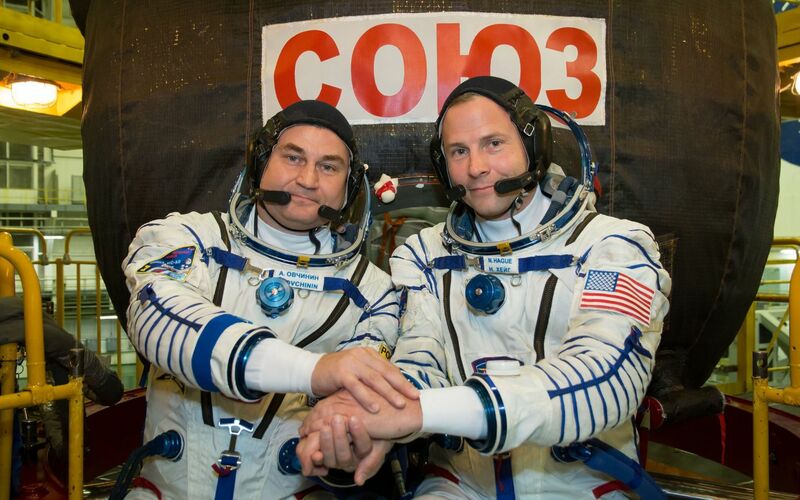 On Thursday, October 11th, 2018, the Soyuz MS-10 spacecraft carrying two crew – American astronaut Nick Hague and Russian cosmonaut Alexey Ovchinin to the International Space Station (ISS) suffered a core second stage failure, triggering an emergency launch abort. Both Hague and Ovchinin survived the ordeal – although the way some of the media were reporting things, one might have thought they were hoping otherwise. Soyuz utilises a R7 booster family of launch vehicle. This comprises a single-engined core element (confusingly called the 2nd stage, surrounded by 4 liquid-fuelled strap-on boosters referred to as the first stage. Each of these also has a single motor with, like the core stage, four combustion chambers. At launch, all five elements are fired, with the four strap-on boosters running for around 2 minutes. Then, with their fuel expended, they are jettisoned. It is at this point – 2 minutes into the vehicle’s ascent from the Baikonaur Cosmodrome, Kazakhstan, that things went awry, and gave observers watching from the ground the first indication of trouble – telemetry being relaid to mission control in Star City, near Moscow give little indication of a problem, causing commentators there to keep to their prepared scripts even as the drama unfolded. Due to the way they fall clear of the core stage, the four strap-on boosters perform a controlled tumble with their exhaust plumes still visible. Seen from the ground, this forms distinctive and almost symmetrical pattern around the core stage called the “Korolev Cross” in honour of the father of modern Soviet / Russian space flight, Sergei Korolev, who also designed the original R7 rockets. On this occasion, however, following separation, a decidedly asymmetrical Korolev Cross briefly formed, before the sky around the rocket became spotted with debris as if something had broken up. At the same time, video of the cabin in the Soyuz vehicle’s decent module, where the crew sit during both ascent to orbit and their return to earth, showed Ovchinin and Hague suddenly experiencing a brief period of weightlessness, almost as if thrust from the vehicle’s second stage had ceased, before they were pushed back into their seats and the plush toy suspended in front of the camera (used as a very rough-and ready G-force indicator) suggested a rapid acceleration. This sudden acceleration was the result of the launch escape system kicking-in, separating the payload shroud containing the upper two modules of the Soyuz from the failing rocket. The manoeuvre recorded a 6.7 G acceleration right when the crew would have been expecting a 1.5G climb up to orbit as a result of jettisoning the spent strap-on boosters. Once clear of the rocket, the fairing deployed a set of aerodynamic breaking flaps, slowing it to allow the Soyuz descent module to detach. The normal parachute and retro rockets where then used to bring the capsule back to Earth and execute a safe landing. Precisely what caused the failure has yet to be determined. As well as recovering the two crew safely and returning them to Baikonour unharmed, teams have also been busy recovering parts of the failure rocket, and Roscosmos believe they’ll be in a position to use the parts so far recovered together with telemetry from the vehicle’s ascent to provide a preliminary report on the failure within a week. In the meantime, space experts have been examining video footage of the launch, and it would appear some form of malfunction during the separation of one of the four strap-on boosters may have caused it to actually collide with the core rocket. In his analysis of the flight, Scott Manley points to both the asymmetrical pattern of debris from the booster separation and what appears to be a radical slewing in the exhaust plume of the core stage as evidence there was some form of collision. Some confusion also exists over what actually happened during the abort sequence. 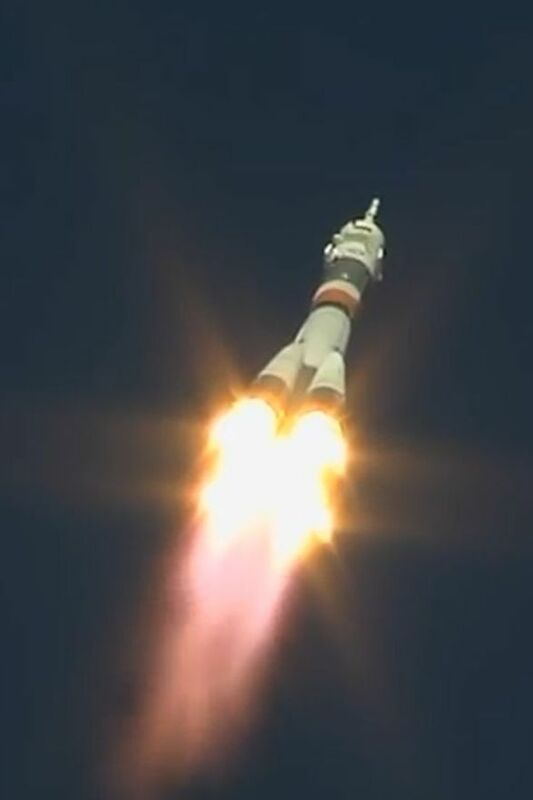 Like Apollo crewed rockets, Soyuz has a tower-like escape system at its top. In an emergency, rockets mounted in the tower fire, pulling the crew module clear with a brief acceleration of about 14 G. As the reported acceleration with MS-10 was less than this, there was speculation the escape system hadn’t been used. However, the Russian escape system, called the Sistema Avariynogo Spaseniya (SAS), unlike American systems, has two sets of motors: those in the tower, and a set of lower-thrust motors mounted directly on the payload fairing, and capable of around 7 G acceleration – the reported speed of the Soyuz on separation. It’s theorised it was these motors that pulled the Soyuz clear, the vehicle not having reached a velocity warranting the use of the tower rockets in order to pull the Soyuz clear. 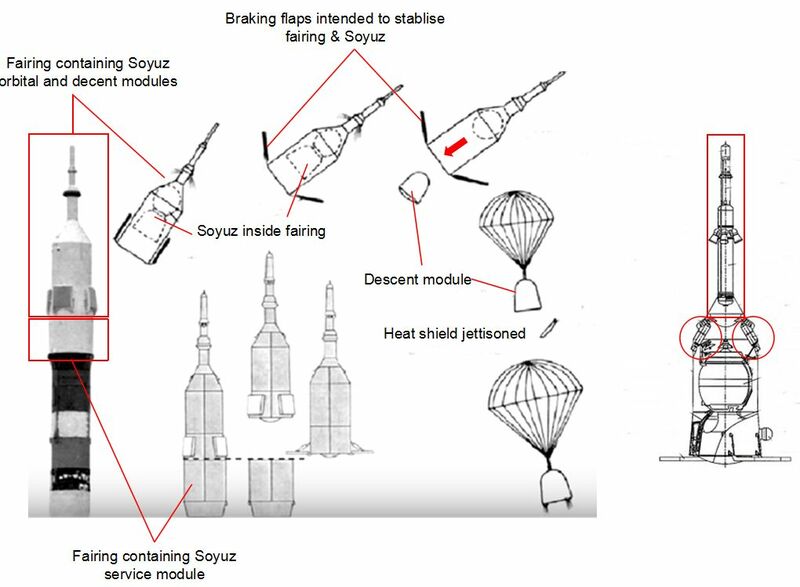 Left: the Soyuz escape system (SAS) and how it works. The system uses two sets of motors which can be used together or independently of one another to pull the upper section of the payload fairing and the Soyuz clear of a malfunctioning rocket. The Soyuz descent module can then jettison, using its parachute and landing motors to return to Earth. Right: The SAS motor tower (boxed) with four rockets, and the second set of 4 RDG rockets mounted on the payload fairing (ringed). Credits: assorted.